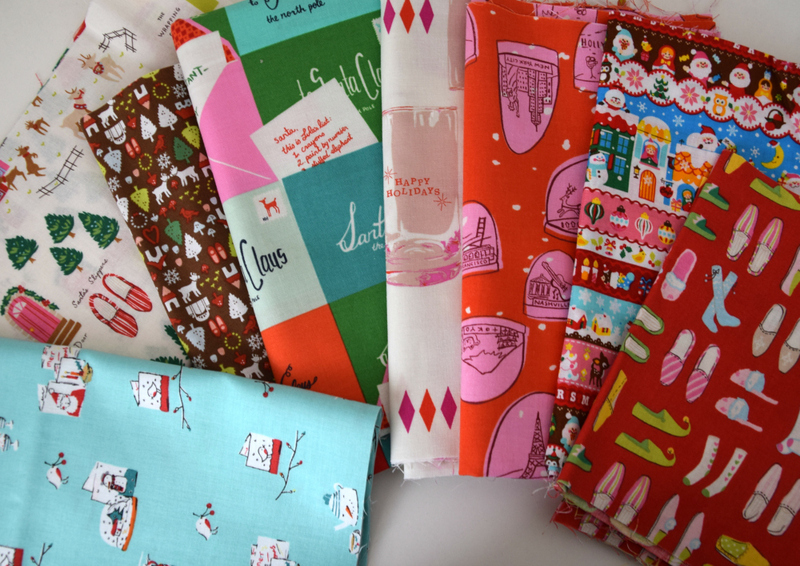 I have noticed recently a number of fabric stores posting about new Christmas fabrics they have in stock or are arriving soon. This reminded me of the Christmas Pillow Swap that I hosted last year. I had so much fun with the swap that I am going to host another this year. I loved seeing all the amazing Christmas themed pillow covers that everyone created and really enjoyed making for my partner. This is the Christmas pillow I made last year for my partner. I used a Playing with Paper Pack from Sue Daley and a variety of lovely Christmas fabrics that I had in my fabric stash. And this is the amazing Christmas pillow that I received. Here are the details, I hope you join in the Christmas fun! 1. To try and ensure everyone receives their item by Christmas, the posting deadline is 1st December if shipping international and 9th December if domestic. 2. Please make sure the cushion cover is at least 12″×12″ in size. It would be helpful if you could make it the size of a standard cushion insert. I know my local craft stores and homeware stores stock a variety of sizes of cushion inserts. 3. 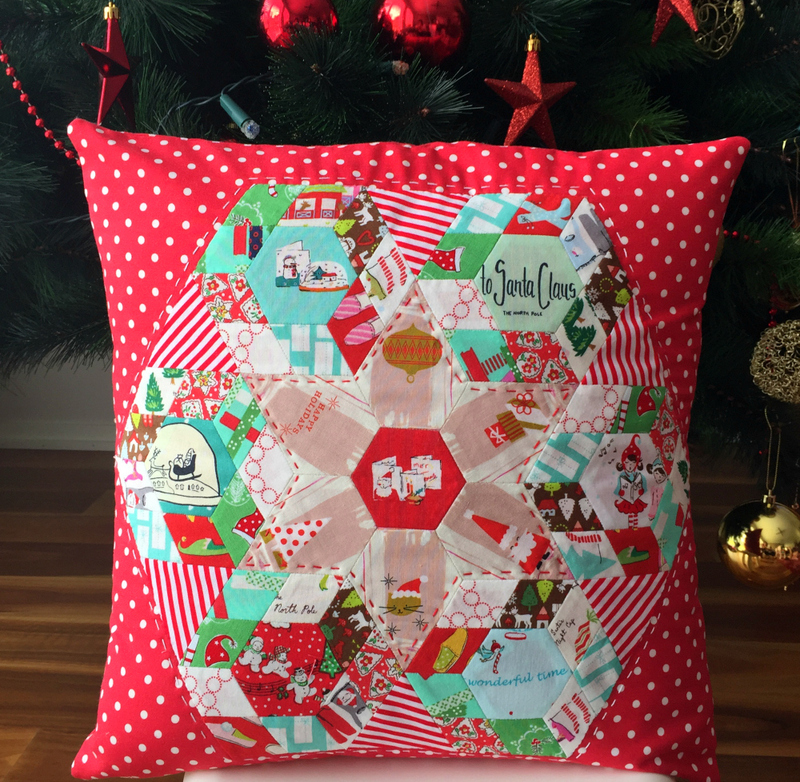 You do not have to use Christmas fabric BUT the pillow MUST have a Christmas theme. 4. 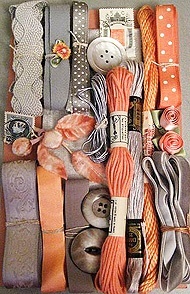 You are required to create a mosaic to assist your partner with colours and styles that you like. Also at least 2 update photos are needed to show progress with your swap item and a photo of the finished pillow ready to post. Please use the hashtag #christmaspillowswap2017 on Instagram. 5. It is not necessary for you to have an Instagram account to participate. IF you do not have an Instagram account, you will need to send me your mosaic and photos by email or using Facebook. If you do have an Instagram profile, can you please make it ‘Public’ for the duration of the swap or send me your photos by DM or email. 6. This is secret swap. 7. Extra goodies are not required. 8. If you are unable to complete your swap item, please let me know as soon as possible so other arrangements can be made for your partner. 9. If you have any further questions, please contact me by email monkeymai@y7mail.com or DM me on IG @monkeymai26. If you would like to participate in the Christmas Pillow Swap please complete the form below. The sign up deadline is Thursday 24th August. Christmas is such a wonderful time of year, delicious food and special times spent with family and loved ones. One thing I especially love is all the fabulous Christmas themed items that people sew and create for gifts and for themselves. 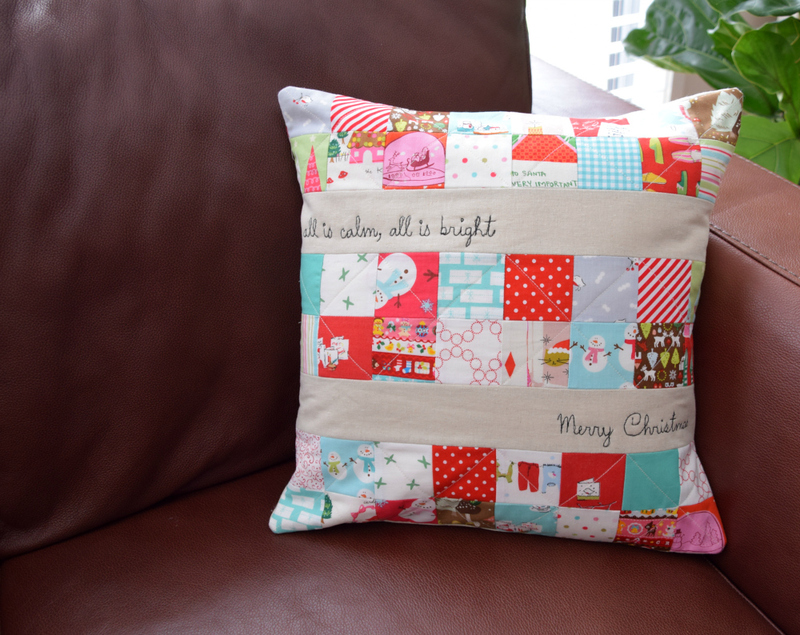 A Christmas item that I hadn’t made until recently was a Christmas pillow. I followed this tutorial from nanaCompany to make my first one. Every year, I see lots share on social media wonderful Christmas themed pillow covers they just finished which makes me think of how fabulous it would be to receive one. So, this year I thought I would organise a Christmas Pillow Swap! Here are the details. I hope you join in the fun! 2. Please make the cushion cover is at least 14×12″ in size. It would be helpful if you could make it the size of a standard cushion insert. I know my local craft stores and homeware stores stock a variety of sizes of cushion inserts. 3. The pillow MUST have a Christmas theme. 4. It is not necessary for you to have an Instagram account to participate. But if you do, please post a mosaic on Instagram to assist your partner with colours and styles that you like. And also try and remember to post progress pics. Use the hashtag #christmaspillowswap2016. 5. This is secret swap. 6. Extra goodies are not required. 7. If you are unable to complete your swap item, please let me know as soon as possible so other arrangements can be made for your partner. 8. If you have any further questions, please contact me by email monkeymai@y7mail.com or DM me on IG @monkeymai26. If you would like to participate in the Christmas Pillow Swap please complete the form below. The sign up deadline is Monday 12th September. February was a much busier than usual month with my youngest daughter’s birthday and my birthday. 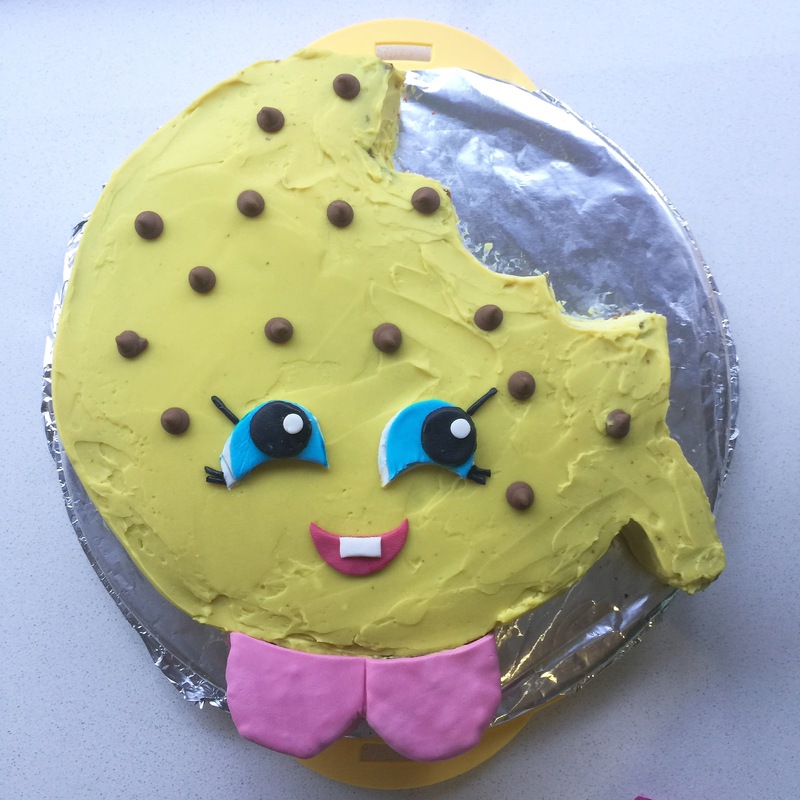 Here is the Shopkins Kooky Cookie cake that I made for my little miss. The store front for my business Little Mai also closed during February (we are online only now) so there was a lot of work with packing and moving all the stock home and I am STILL trying to find space for everything! So, as a result of my crazy busy month of February, I did not get a chance to organise the March Hexies-A-Month! My apologies to everyone that was waiting for the March swap. But I am a bit more sorted and ready to organise the April swap. Here are the details. 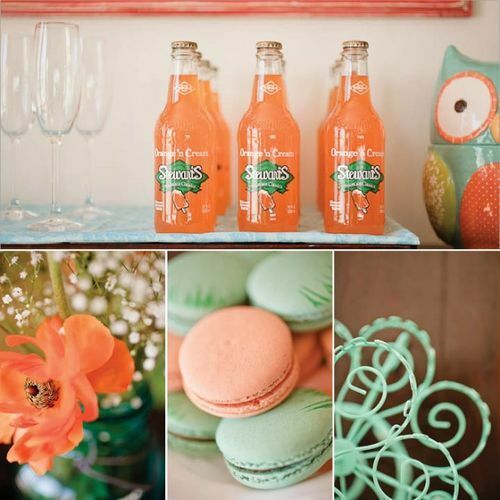 The ‘special’ hexies theme for April is CUTE FUSSY CUT prints and the colour theme is ORANGE. 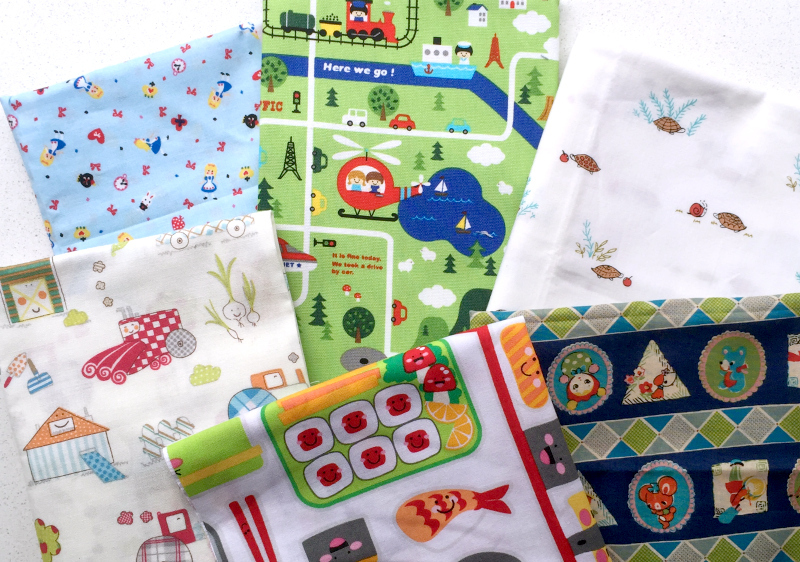 I love cute fabrics and they are perfect for fussy cutting! 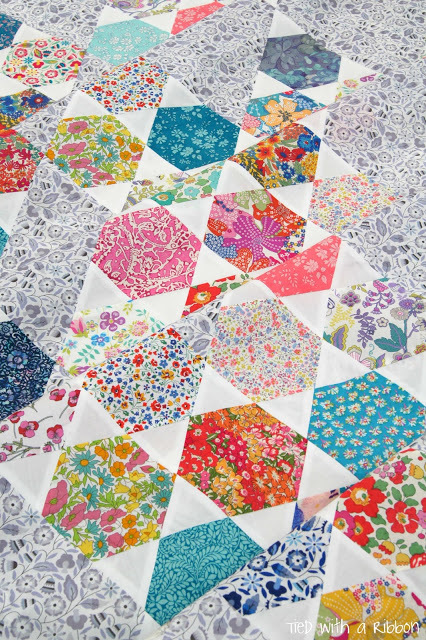 And here is a gorgeous mini quilt that Clover and Violet made using numerous fussy cut hexies with cute prints! If you would like to sign up for April’s fun hexie swap, here are the details. You are required to send a minimum of 20 sewn or glue basted 1.5″ hexies per theme per month. 1.5″ is the length of one side of a hexie. You are more than welcome to send more than 20 hexies if you would like to swap more. It is very important that you post the hexies to me by the 15th of each month, to allow time for me to receive them and to post the hexies out to everyone by the end of the month. Please put the hexies in a ziplock bag along with your name, mailing address and email address. If you are in Australia, please include a pre-paid envelope or satchel. Bubble or plastic envelopes are great as there is no risk of tearing in the mail. If you are international you will be required to pay $7 AUD postage for me to send the swapped hexies back to you. All hexies should be made using quality 100% cotton or cotton/linen blend quilting fabrics. You can have duplicates. The idea of this swap is to use fabrics from your stash. I will do my best to swap as fairly as possible, depending on how many people participate and how many different hexies are sent will determine how many there is to swap. Please fill out this form to participate. If you are outside of Australia, please click here to pay the postage fee. I will send a confirmation email once you have filled out the form. Please feel free to spread the word about this swap, the more swappers, the larger the variety of hexies. And use the hashtag #hexiesamonthswap or #hexiesamonth on IG. I look forward to hosting a fun swap with everyone! I can’t believe that February is nearly here already! For February, the ‘special’ fabric theme is LIBERTY FABRICS and the colour theme is RED. Liberty Fabrics are one of my favourite fabrics and there are so many different prints available. I have a really good variety of Liberty after signing up to a monthly bundle with Westwood Acres but there are so many more that I know I don’t have. I plan on making a cushion cover with the Liberty Hexies from this month’s swap. What will you make with yours? A pouch or bag, this lovely one was created by Where the Orchids Grow. A cushion cover, this one has been made by A Crafty Fox. Or a quilt cover like this beautiful one from Tied With A Ribbon. There will be 2 Hexie Swaps per month, one ‘special’ fabric theme and one colour theme. You do not have to participate every month and you do not have to participate in both of the swaps in that particular month. You will be required to send 30 sewn or glue basted 1.5″ hexies per theme per month. 1.5″ is the length of one side of a hexie. Scale matters, please try and choose prints that will work for hexies, smaller prints work best. 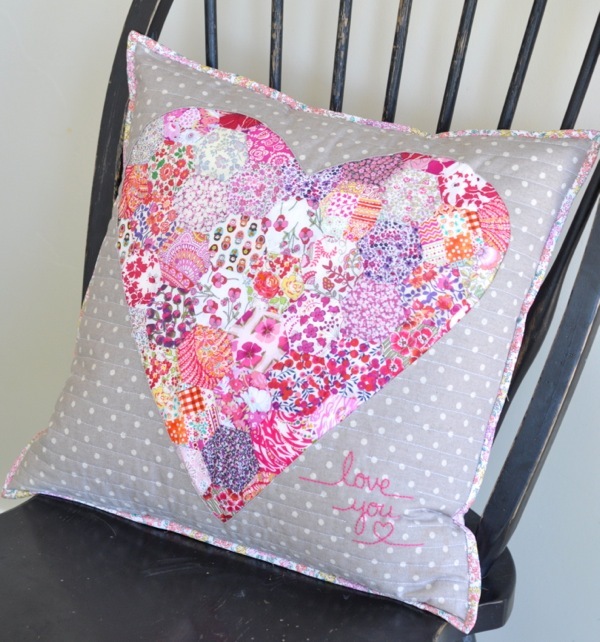 Do you love hexies and EPP as much as I do? 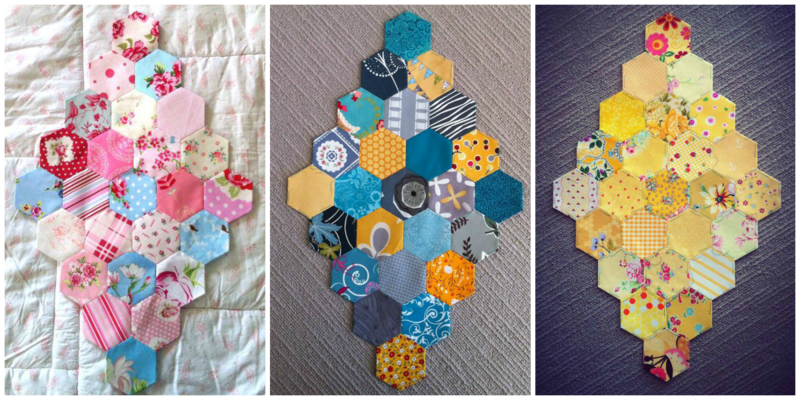 Would you like to expand your hexie collection without purchasing more fabric? Then this swap is for you! 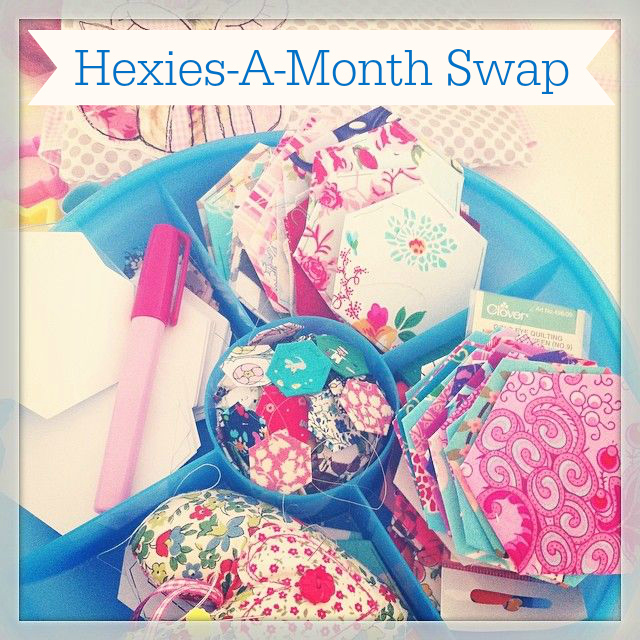 This Hexies-A-Month swap will enable you to have hexies in fabrics that are different from your fabric stash. 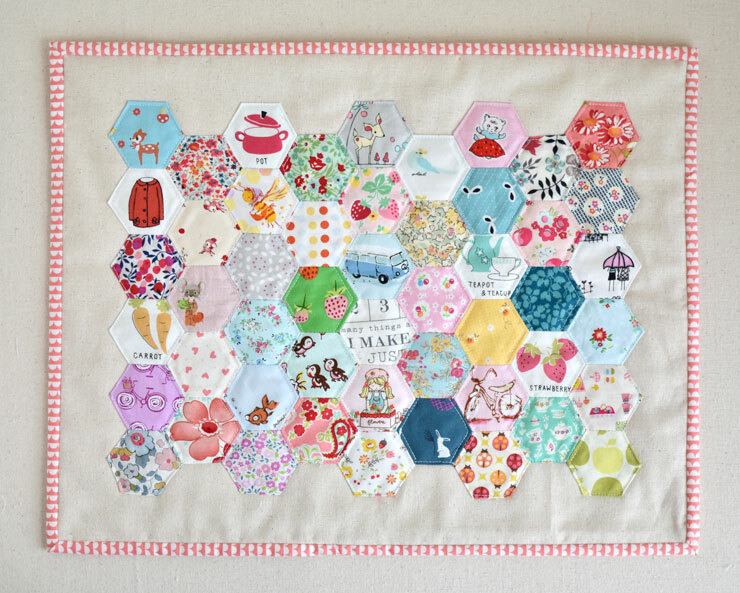 You will be required to send 30 sewn or glue basted 1.5″ hexies per theme per month. There is a participation fee per month which is the same whether you participate in only one or both of the monthly swaps. If you are in Australia it is $3. Alternatively if you located outside of Australia, the fee is $10 AUD as I will have to pay for postage back to you. If you are international, I will be happy to send your hexies every 2 months to make it more cost effective. I will refund the extra postage cost for the second month if this is the case. For January, the ‘special’ fabric theme is Cotton + Steel and the colour theme is Low Volume. And please click here if you are in Australia to pay the participation fee. Or here if you are outside of Australia. I will send a confirmation email once you have filled out the form and paid. This is a secret swap, so please try not to give away who you are making for. Feel free to post photos of your fabric basket progress on social media, I’m sure we would all love to see what each other is making. I will be using the tag #fabricbastswap2014 on Instagram. Please have your fabric basket in the mail by Friday, September 5, 2014. You can mail earlier, but please not before August 22 . You can send small extras with your basket, it is not a requirement though and is totally up to yourself. Fabric baskets can be as small as 6″ x 6″ x 6″ and as large as 10″ x 10″ x 10″. They can be any shape you like. If, for any reason, you are unable to complete your fabric basket, please advise me as soon as possible so I can ask for the help of a swap angel. You can email me, send a message via my FB page or on IG. I used the Nesting Fabric Bowls pattern by Nova from A Cuppa and A Catchup to create the fabric baskets in the above photo. 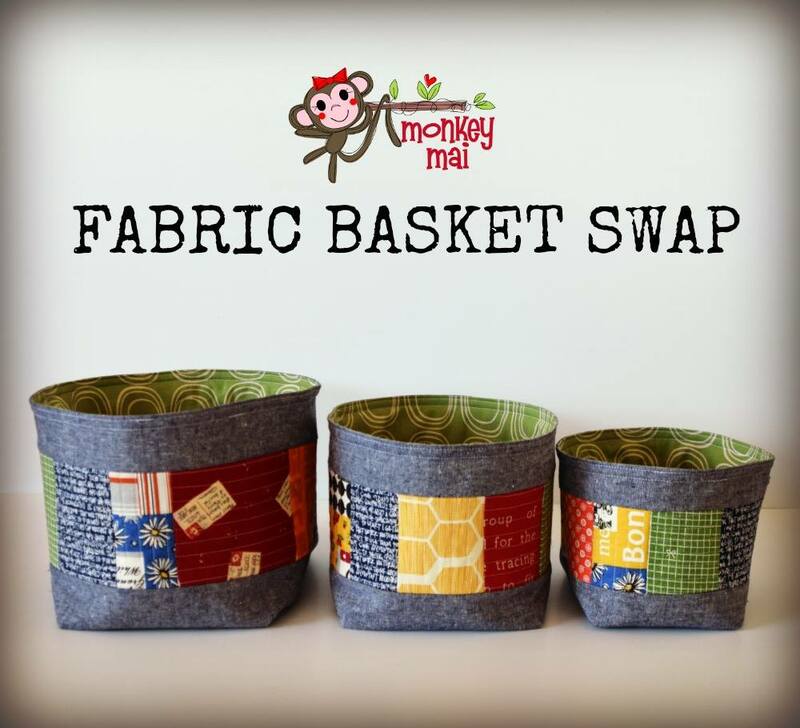 It is an easy pattern to follow and provides the instructions to make 6 different sizes and some variations like adding handles or making the baskets square. Here are some others that I have made. The two smaller ones at the front I purchased from Piggledee. 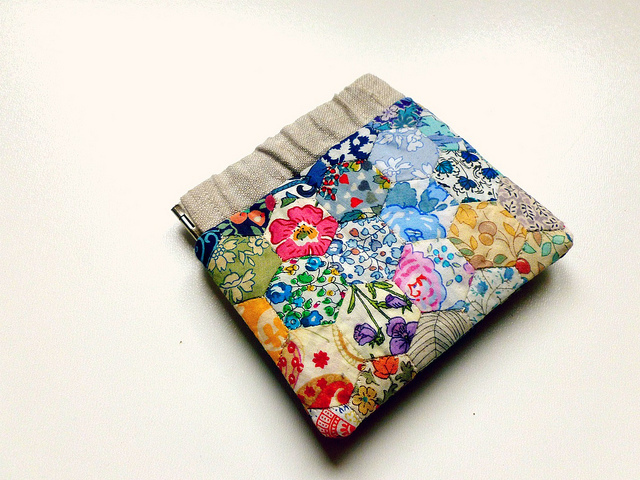 She makes wonderful items using the sweetest Japanese fabrics. 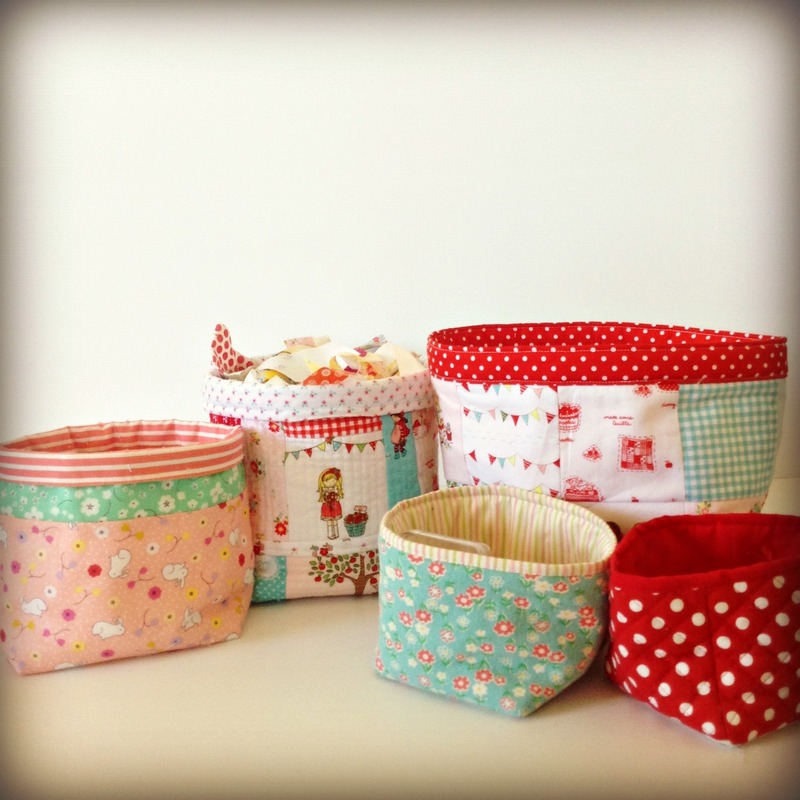 I used the ‘Fabric Bins’ tutorial over at the Birch Fabrics blog to create the fabric basket in the back middle. It is a very easy pattern to follow and sew. I recently purchased the Divided Basket Pattern by noodlehead which I am very excited to try. I am hoping to get a chance to make it over the next couple of days so will post photos when I finish the basket. If you would like some more inspiration for fabric baskets please have a look at my Pinterest board ‘Time for Fabrics’. 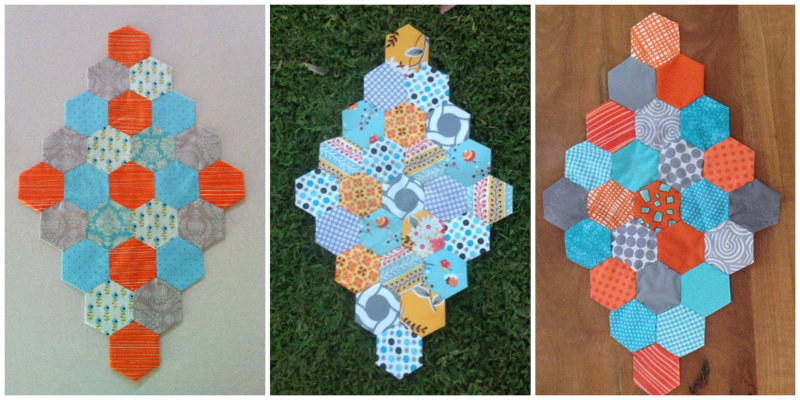 So, another crafty swap that I am currently involved in is a Hexie block swap. I learnt how to sew hexies last year with the help of a couple of great tutorials. This hexie tutorial from Echinops and Aster and this one from Mommy by day Crafter by night were the most helpful to me. I am not a great fan of hand-sewing but once I began making hexies, I quickly became addicted to them. 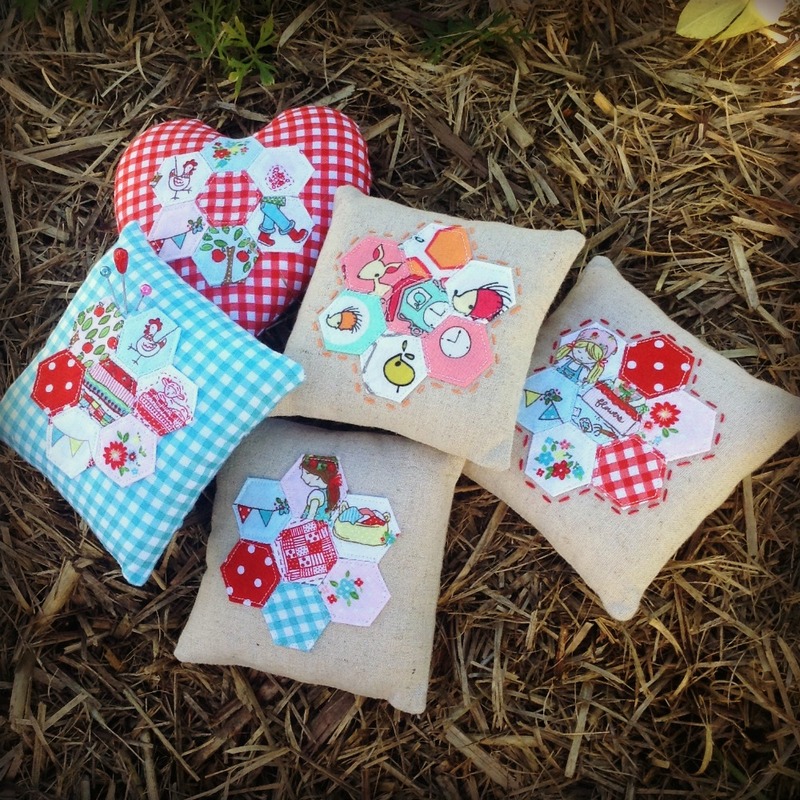 I started sewing lots and lots of half inch hexies which I used to make pincushions like these. After making numerous half inch hexies, I wanted to progress and start a on hexie quilt like so many beautiful ones that I had seen. But I knew it was going to be a very long work in progress! So, a more fun, and probably quicker way to finish one was to join a group swap! I am participating in a year long swap of diamond block hexies amongst some great ladies that I have met on Facebook. We have set ourselves a target of completing one block a month. Each of us have chosen a particular colour theme for our blocks. My colours are a beautiful combination of orange, aqua, grey and white. Here are just a couple of pics that I found on Pinterest to use as my inspiration. Here are the three blocks that I have received so far. I haven’t quite figured out how I am going to combine the blocks for a quilt but this is definitely a wonderful, motivating and interactive way to make one. And these are the blocks that I have made for monthly partners so far. I love random hexies pieced together so am using a different fabric for every hexie in my blocks unless my partner specifies a certain pattern.